Olympus Labs release of AMNES1A gives us an innovative multifaceted sleep aid. Longer days filled with harder work and more stress makes sleep a very important function that not many people get enough of. Whether that be due to lack of time or being unable to calm down. But with the goal of bodybuilders being the ability to build muscle through the best performance they can manufacture, recovery from workouts by utilizing the food they are eating and getting the necessary amount of sleep to fully recovery. Most sleep supplements will cause grogginess and aren’t effective in actually allowing you to hit a deep REM sleep. AMNES1A is a completely natural sleep aid that has been formulated to slowly calm and ease you without the grogginess upon waking. The improved sleep AMNES1A will provide will allow you to progress in the gym, improve your quality of life, result in a better mood, help your memory, and keep you in good weight management and hormonal balance. 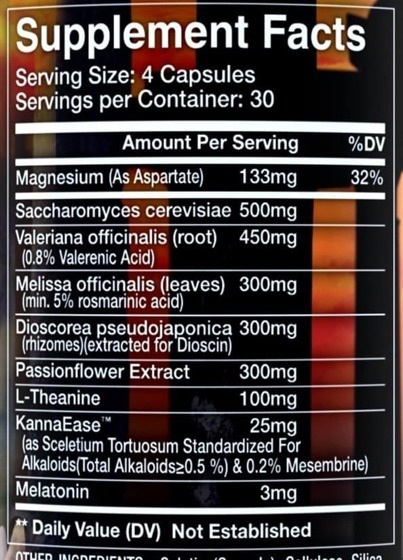 AMNES1A contains 9 optimally dosed ingredients based on research. The science is what really separates AMNES1A from other sleep aids on the market. Saccharomyces Cerevisiae (Sake Yeast) –Type of yeast used to produce Japanese rice wine and other traditional foods. Research shows it acts as a regulator of sleep and sleep-wake regulation and displayed deeper sleep and increased growth hormone secretion properties. Dioscin – Stimulates growth hormone which will yield lean mass building and improved recovery while you rest. KannaEase – Has been used to treat anxiety and depression by promoting the wellbeing and other cognitive benefits. Passionflower Extract – A calming herb that increases hamma aminobutyric acid in the brain which lowers the activity of brain cells resulting in feeling calm and relaxed. Valeriana Officinalis– Calerenic acid binds to GABA receptors to provide a sedative effect and improved the amount of time you sleep. Has been clinically used to treat restlessness, tremors, and anxiety. Melissa officinalis L. – Boosts mood and cognitive performance while also having sedative properties. L-Theanine – Promotes mental relaxation, lower blood pressure, and improve learning ability. Higher doses have shown increased signs of relaxing and calming users by decreasing serotonin and increasing norepinephrime in the brain. Melatonin– Hormone secreted by the brain that regulates sleep. Magnesium Aspartate– Aids in GI distress, reducing blood pressure, and blood sugar regulation. Boosts the bodies overall function which can be very useful during periods of rest. Take 4 capsules (1 serving) one to two hours before bed. Do not exceed 4 capsules in a 24 hour period of time.